Having previously resigned myself to the heart rending belief that ‘Series Six’ was the final hurrah for ‘Gallifrey’, I was more than a little shocked and excited to discover that ‘Intervention Earth’ was set to continue the legacy laid down by, previous series. The countdown began and I awaited its arrival with nervous expectation and, strangely, a growing sense of trepidation following the news which reached me first through whispered rumour and later confirmed, that Lalla Ward and Louise Jameson were not going to be in the new release. After all, Romana (the incarnation played by Lalla that is) and Leela were central to the series; but if it could survive the departure of Braxiatel (apart from the versions from alternative realities and universes that kept appearing) then it could also survive the omission of two more of its stalwarts. Couldn’t it? Oh yes, it most definitely could, and it does. 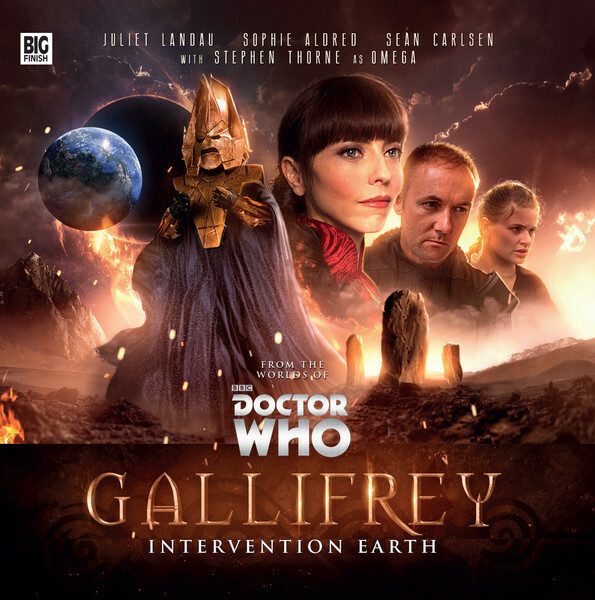 Not that they aren’t missed of course, but this is a very different ‘Gallifrey’, one led by a very different Romana (played by Juliet landau, who was first introduced in ‘Series Six’), the pragmatic, emotionally cold and distant president of a world teetering on the brink of crisis.